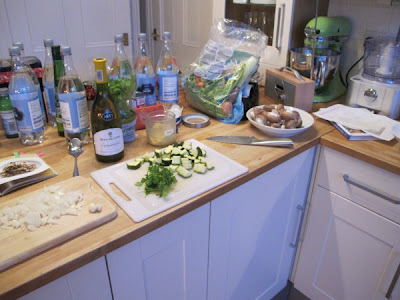 This evening I made one of the meals from my M&S Easy Healthy book. It is supposedly Quick Mushroom Risotto but since it took me an hour to make I would say I have definitely made quicker risottos!! It was nice though but has a very strong flavour so only try this if you really like mushrooms! The recipe only served 1 (apparently) so I doubled the quantities but still had loads left over! I have written the values I used below and my slight adjustment to the oil:butter ratio in favour of more oil. 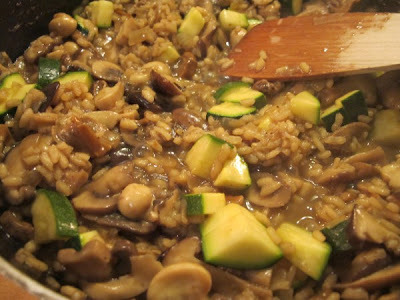 Put the dried mushrooms in a bowl , cover with water (they will float, don't add too much water as it gets added later) and allow to soak for 30 mins. About 5 mins before the soaking time is up (i.e. the time it takes you to chop and organise everything anyway) heat the oil and butter in a large non-stick frying pan and sauté the onion and garlic for about 5 mins until soft. 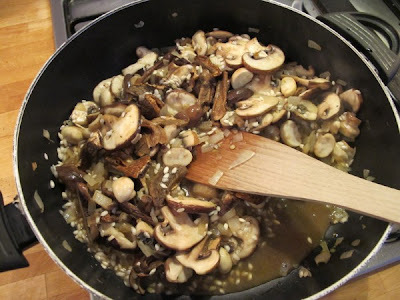 Add the fresh mushrooms and black pepper, stir well and cook for 1-2 mins. 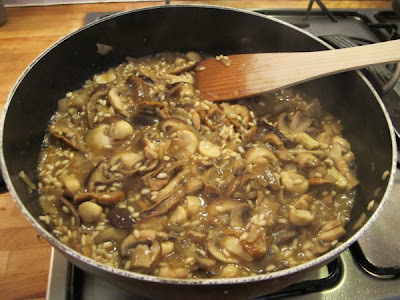 Add the rice, soaked mushrooms with their water, (stock) and wine and stir. 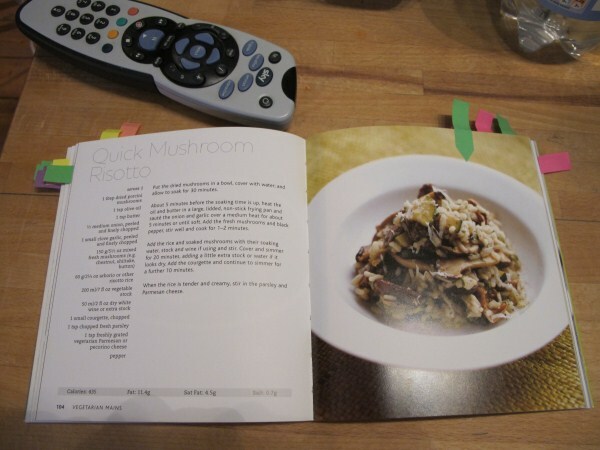 (The book says to cover and simmer for 20 mins at this point but that't not how I was taught to make risotto.) Add the stock a ladle at a time and simmer, stirring constantly as it soaks in. If you run out and the risotto is getting dry, add ladle-fulls of the boiling water or more stock if you prefer. 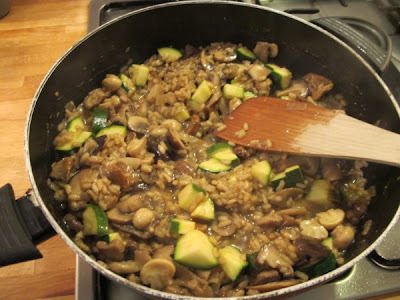 After 20 mins add the courgette and continue to simmer for another 10 mins (I did cover it at this point but keep stirring every so often and checking if it needs more liquid). 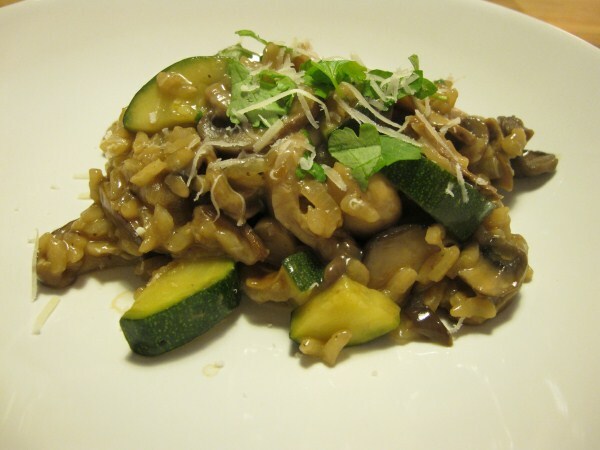 When the rice is tender and creamy, stir in the parsley and Parmesan cheese. Serve with a sprinkle of Parmesan.